Yes, I know this post is a day late, but I will say it anyway. Merry Christmas! I was busy celebrating with family and had too much fun to break away to post something. I hope all of you had a wonderful Christmas and it was filled with plenty of LEGO®! If you get a chance, share what you received and what you’re most excited to build! I was quite surprised with the gifts I received! 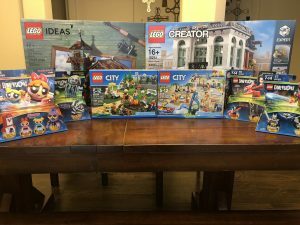 I’m looking forward to building these sets and sharing my thoughts on them. I also need to rethink what I currently display in my office. With the addition of the two people packs, I am starting to think I need to make my town a bit more lively! The Old Fishing Store would make a nice location for a beach scene as well. While LEGO® Dimensions is on the way out, I am excited to add Beetlejuice to my collection. I grew up watching that movie, and it’ll be exciting to run around that world! I hope all of you have a safe and wonderful New Year, and I’m looking forward what 2018 has to bring!